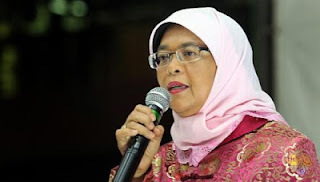 Singapore: Minister of State for Social and Family Development Halimah Yacob has been announced to People's Action Party MPs as the party's pick for Speaker of Parliament. Madam Halimah, 58, will be elected to the role - vacated by disgraced former Speaker Michael Palmer last month due to an extra-marital affair - at next Monday's Parliamentary sitting. The former unionist will be the country's first female Speaker. She will have to resign from her ministerial post to take on the Speakership, as the Constitution requires it. Besides being the ceremonial head of Parliament, the Speaker assumes the duties of the President if the President and the chairman of the Council of Presidential Advisers are both away.